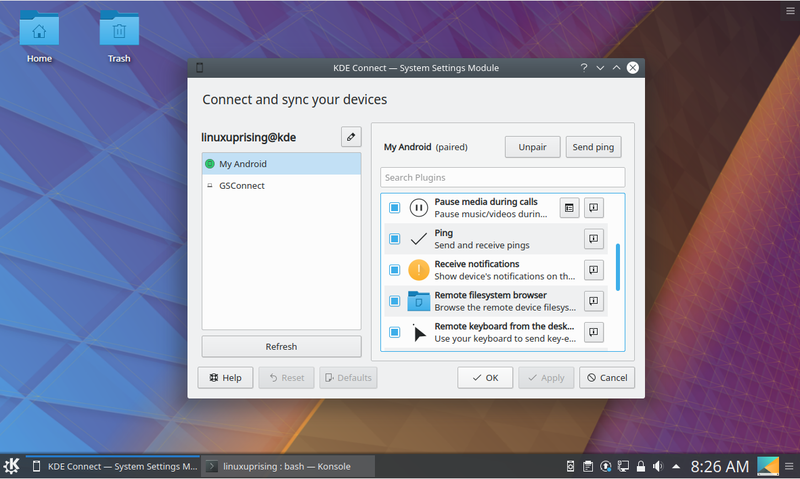 KDE Connect is a project that helps integrating Android devices with Linux desktops, allowing you to receive phone notifications on your Linux desktop, easily transfer files between Android devices and a desktop, use your phone as a desktop remote control, synchronize the clipboard across devices, and more. While it's created for KDE / Plasma desktop, KDE Connect works on any desktop, and there are various third-party implementations, like an Ubuntu AppIndicator, or the Gnome Shell GSConnect extension which implements the KDE Connect protocol for Gnome Shell, without requiring KDE dependencies. Some progress was also made for Bluetooth support. This is a much requested feature - the ability to use KDE Connect via Bluetooth, instead of the current implementation which only supports using the same local network -, and it will probably take some time until it's fully ready, so don't expect it just yet. Another interesting new feature, which is not mentioned in the article describing the work done over this weekend, is a new plugin to cast on a KDE Connect powered display. I couldn't find too much information about this except the code available on a branch on the KDE Connect Git, which mentions this is a "rough implementation" for now. For more information about KDE Connect, including how to contribute, see this page.